Last year, Jeep hit its 75th anniversary and the brand doesn’t seem to be slowing down anytime soon. In fact, in the next few years, there will be a new platform for the Wrangler and some new Jeep models. One of the favorite Jeeps out there, next to the Wrangler, is the Jeep Renegade, known for off-roading mayhem and rock-crawling galore. When it comes to the 2017 Jeep Renegade, there are two drivetrains and two engine types. In turn, depending on the drivetrain, certain models are available. With front-wheel drive (FWD), the standard engine for the majority of the trims in the Renegade lineup is a 1.4-liter MultiAir Turbo engine. Designed with MultiAir technology and VVT, air intake is controlled without a throttle valve, resulting in improved horsepower (160) and torque (184 lb-ft). When the Renegade is equipped with this engine, its average fuel economy is 24/31 mpg city/highway. If opting for a 4×4 drivetrain, two things happen. One, although the second engine option is available with FWD, with 4×4 the 2.4-liter Tigershark MultiAir 2 engine, generating 180-horsepower and 175 lb-ft of torque, can be used to its full capability. Second, the mighty Renegade Trailhawk becomes available, complete with its own 4×4 system. Jeep has always been known for its 4×4 systems, and it’s pretty clear why. They bring out the best of the Jeep name, offering not only 4×4 drive but also traction for all-weather capability and rock crawling. Specifically, these features depend on the 4×4 system; the Active Drive system is available on the Jeep Renegade Sport, Latitude, and Limited, and is a part-time 4×4 system. This means the vehicle is usually in FWD, but when sensors pick up the need for more traction, 4×4 is engaged. The 2017 Jeep Renegade Trailhawk comes with Active Drive Low, a 4×4 system that is a clone of the above, but adds low-range for additional capabilities when low-speed traction is needed like pulling a boat trailer out of a lake. The crawl ratio is 20:1 for more controlled throttle response at low speeds. Both 4×4 systems come with the Selec-Terrain Traction Management System where the driver can pick the best setting for the driving conditions from: auto, snow, sand and mud. Is it really hard to tell a Jeep apart from everything else on the road? Yes, all SUVs look alike, but from the back, no one can copy the X accents on the taillights, a signature of Jeep’s heritage style and its roots starting in the military. Details like that are what give the Jeep Renegade a bold and rugged look, but it’s not without its luxury. A My Sky sunroof is available for a little fresh air when going off-road. Some of the exterior features on the 2017 Jeep Renegade are automatic headlamps (standard on all but the Sport trim), standard halogen lamps with turn-off time delay, available power heated mirrors, deep tint sunscreen glass (standard on all but the Sport trim), and of course the reconfigurable option to remove the My Sky panels. The Renegade is available with 16, 17, or 18-inch wheels depending on the trim, drivetrain, and buyer preferences. For personal styling, buyers can choose from about nine colors. Jeep is notorious for putting the luxury features on its high end trims. They’re affordable, but can you put a price on driving in style and comfort? Leather trim and other upscale features like a heated steering wheel are only available on the Limited trim, as is automatic temperature control. Convenient features such as the electronic vehicle information center are standard across the lineup, and so is the cluster display (varying size and color based on trim) and steering wheel mounted audio controls. For cargo space, cargo tie down loops are a lineup standard. There is also the option for roof racks that fit nicely with the sunroof. Depending on the trim, 60/40 and 40/20/40 split-fold rear seats are available for changing seating arrangements and opening up storage space. Buyers have the option of three colors to customize the look of the interior. The standard audio system in the 2017 Jeep Renegade comes with 4-speakers and Radio 3.0, also known as Uconnect 3.0. This is on the base trim, Renegade Sport, only, with the option to upgrade to Uconnect 5.0. The rest of the lineup comes standard with Uconnect 5.0 and the option to upgrade to 6.5 NAV and Uconnect Access. A 5-inch touchscreen display is also available on the rest of the trim and a 6-speaker audio system with the option to upgrade to a Beats Premium Audio system. All trims come with a media hub for USB and auxiliary capabilities. 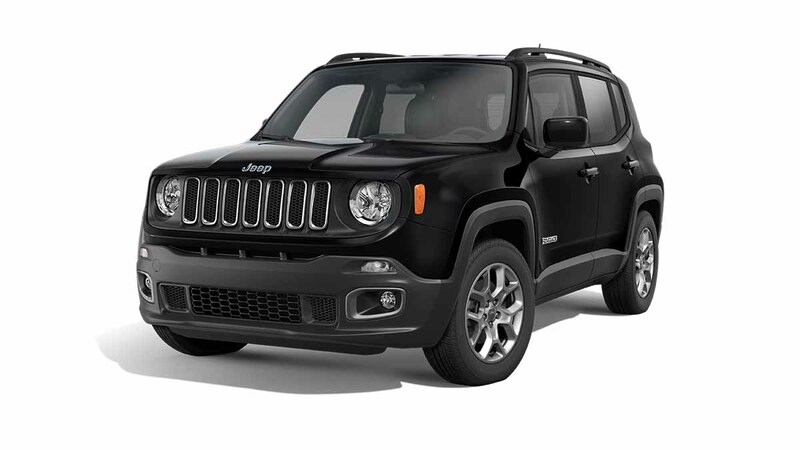 The 2017 Jeep Renegade comes with many of the standard and advanced safety features that were on 2016 models. These include, an advanced multistage front airbag system and supplemental side airbags in the front and rear, stability control systems, LATCH ready anchors for child seats, ABS, and a ParkView Rear Back-up Camera (standard on all trims but the Sport).